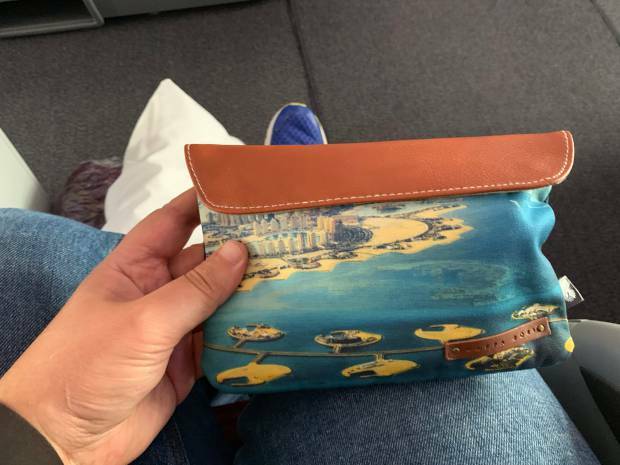 Returning to the Northern Hemisphere, I decided to continue checking out all the different business class offerings in and out of Auckland. 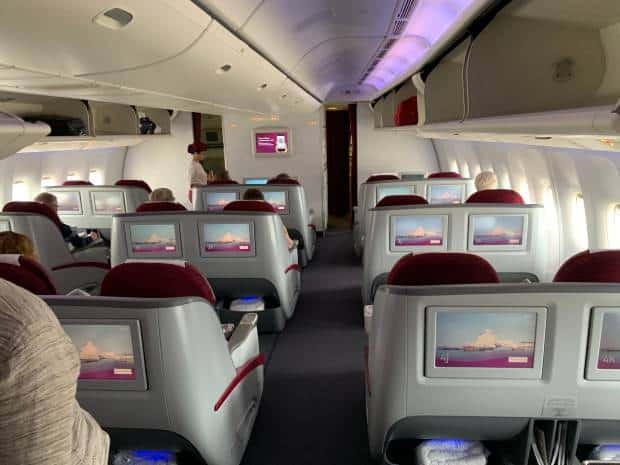 This time in my research I discovered that Qatar Airlines business class had a much vaunted service called Q-Suites which looked pretty good. 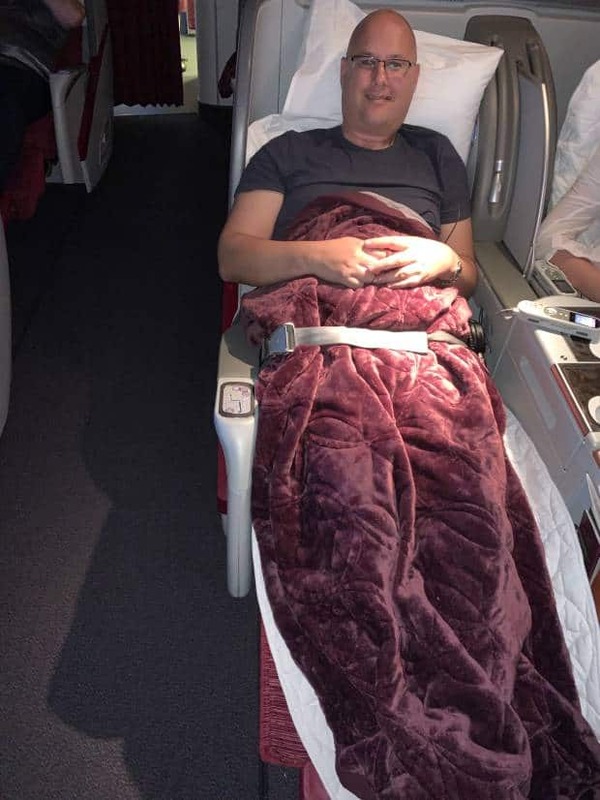 The only problem was that at the time of booking, the flights in and out of Auckland weren’t an aircraft fitted out with Q-Suites. 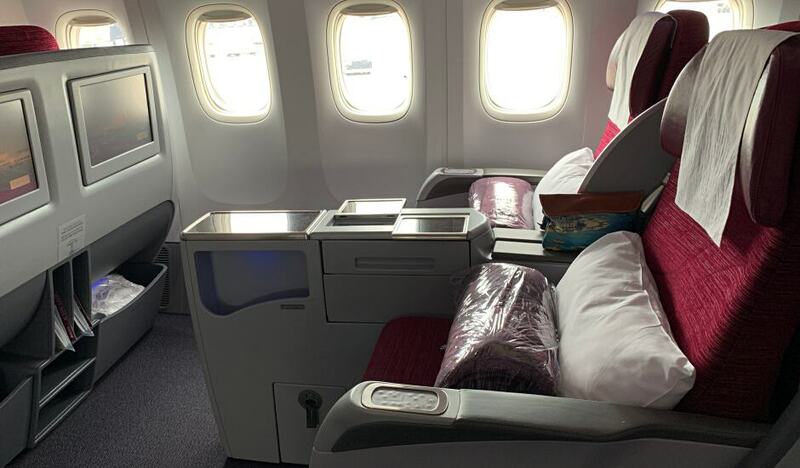 So while Qatar Airlines were rolling the new fit-out to all their aircraft, the Boeing 777-200LR assigned to the 18 hour Auckland-to-Doha route was still sporting the old layout. 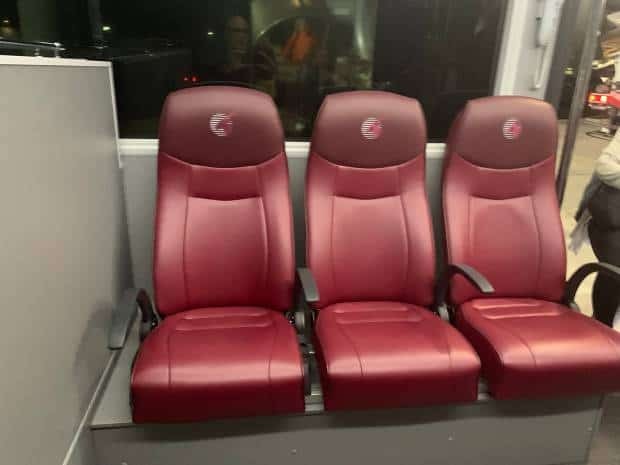 (The New Zealand Herald says the Q-Suites will be introduced on the Auckland-to-Doha route from 1 June 2019). 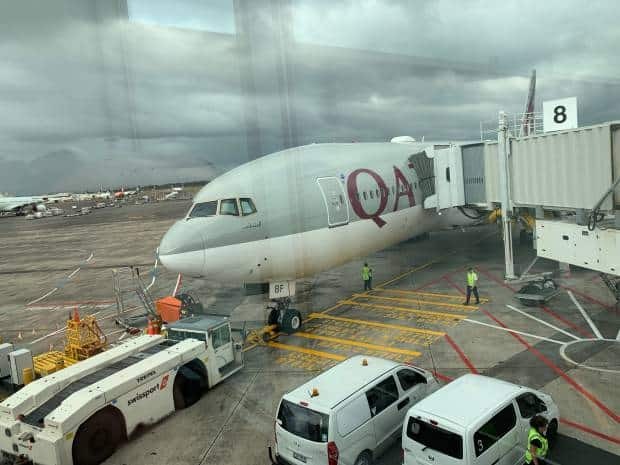 Qatar is part of the One World alliance, and so in Auckland they share the Qantas Business Lounge. I hasten to add that the “old” layout was certainly no threadbare, poorly upholstered static seat from the 1970s! Oh no – my first leg was on the right hand side of the middle pair of the 2-2-2 layout, all facing forward. The legroom was astronomical! 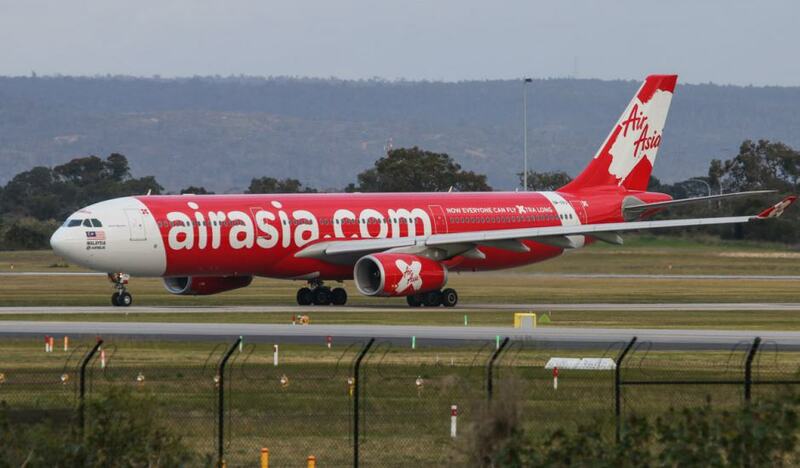 The particular plane, A7-BBF, had been in service since 2010 and still looked well looked after. Boarding was as simple as it gets, rolled out of the lounge and headed over to the gate. A brief scan of the ticket and a two minute wait to get through the door (single door on the 777) and then I’m turning left and checking out the cabin. The seat is supposed to have 78” of pitch and a width of 22”, but with the acres of leg room it some how feels even longer. The nooks and crannies carved into the middle console did a largely admirable job of allowing storage space and hiding the features that need hiding (the remote and dinner table), but I must admit that the connection for the (noise cancelling) headphones was difficult to access being tucked away near your hip. Both myself and the lady travelling beside me couldn’t figure out how to connect, even after being told where the socket was by the attendant. Speaking of which, I can’t speak highly enough of the staff. 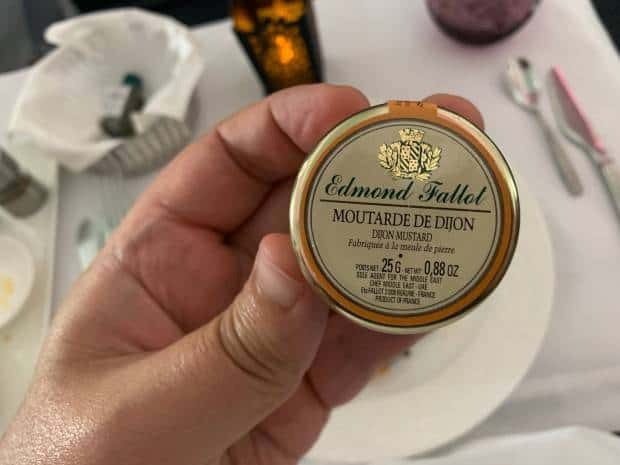 All the business class flights I’ve taken have prided themselves on their soft product – the service provided by the flight attendants. 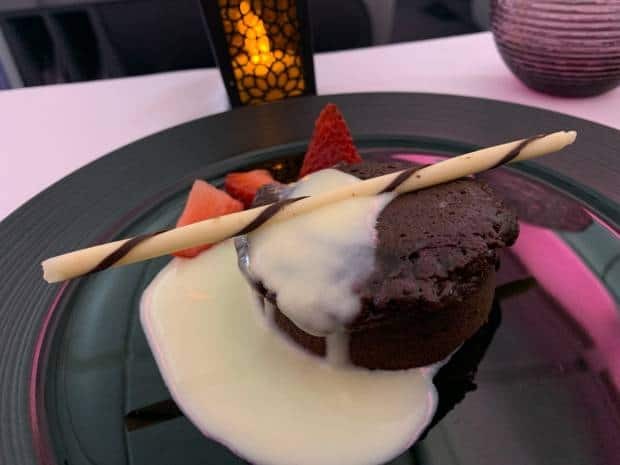 Some (looking at you BA) have been a little lacking, but Qatar certainly went out of their way to welcome me onto the flight, thanking me for flying with them just prior to landing and being attentive during meal times. 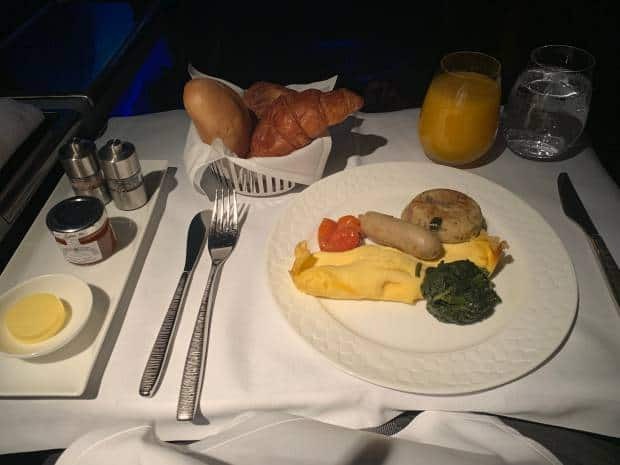 I saw the breakfast service starting from the front of the plane and dinged my little call button and instead of just getting to me when she got to me, Tania came by and let me know she’d just finish up the other passenger’s meals and then would be right by. Expertly handled! 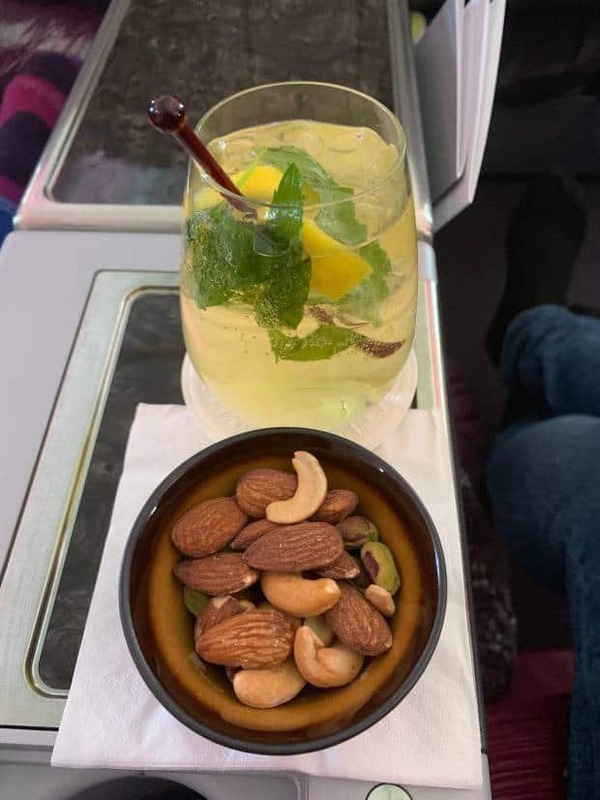 During the flight I was able to get a steady stream of snacks and drinks and Tania was most apologetic when they only had a medium in the complimentary pyjamas. We’d looked from the Medium package to my ample bulk and back again and as a tribute to her training she waited until after I had made the comment that we might just need a larger size before laughing. Bonhomie rather than fat-shaming. 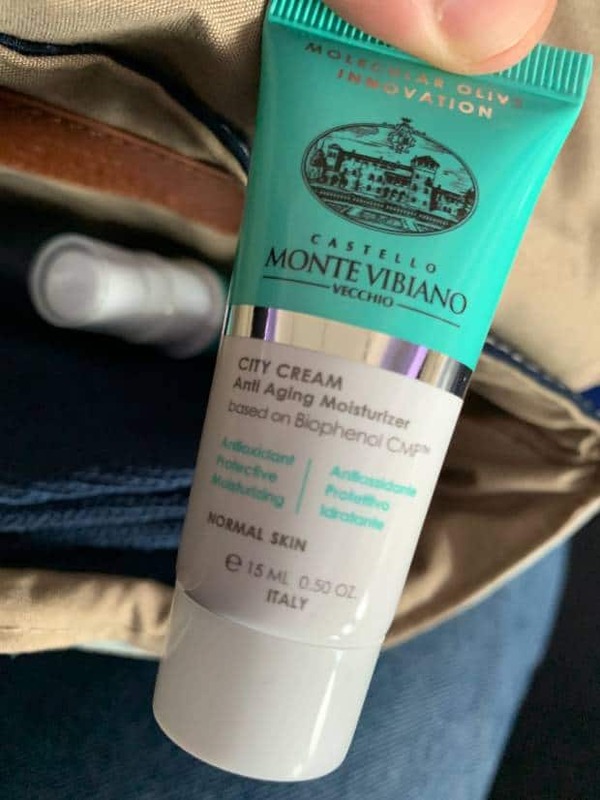 Speaking of freebies, rather than making you wait for the distribution of the amenities kit, they were there sitting on the armrest. I briefly looked inside, snapping a pic for Ange. 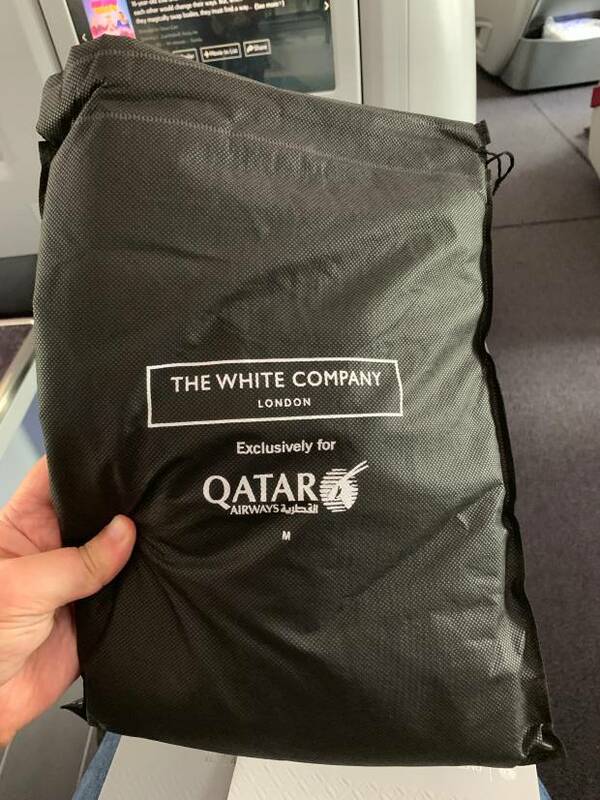 Inside were socks, eye mask, earplugs (though the noise cancelling headphones were perfect for keeping out the flight noise), Costello Monte Vibiano Vecchio cosmetics (Anti Ageing Moisturiser, Hydrating Facial Mist and Lip Balm) all in an attractive Nappa Dori fabric bag. 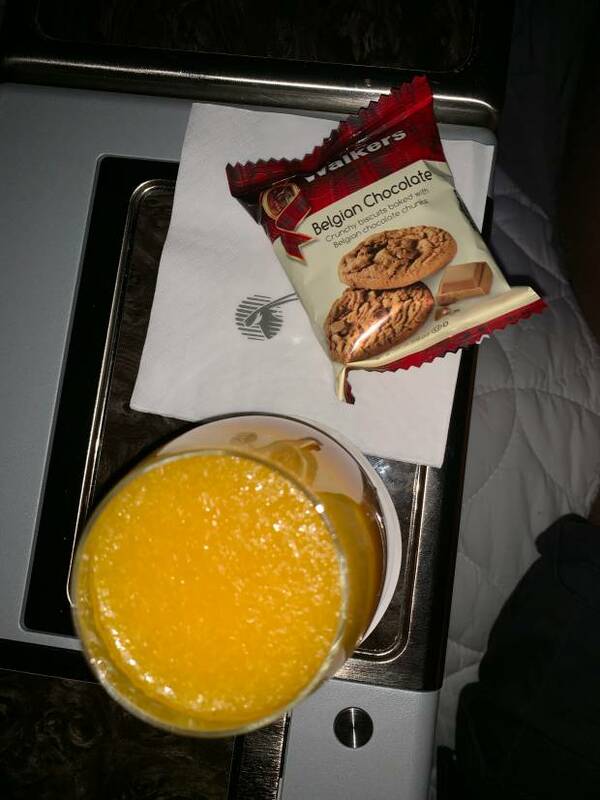 The entertainment system was on from the moment we got on the plane which made waiting for takeoff relaxing, as was the welcome drink and hot towel. We pushed back pretty much on time and set off for one of the longest commercial flights available: across the Tasman to Sydney, across Australia, then swinging up over the Indian Ocean to brush over India and Sri Lanka before the brief dash to the Red Sea and then the kink to avoid flying over any of Qatar’s neighbours as they’re still not on speaking terms. This flight was also supposed to have Complientary WiFi, but every couple of hours when I checked it only ever came up with a “temporarily unavailable” page saying the internet was unavailable. Definitely first world problems! 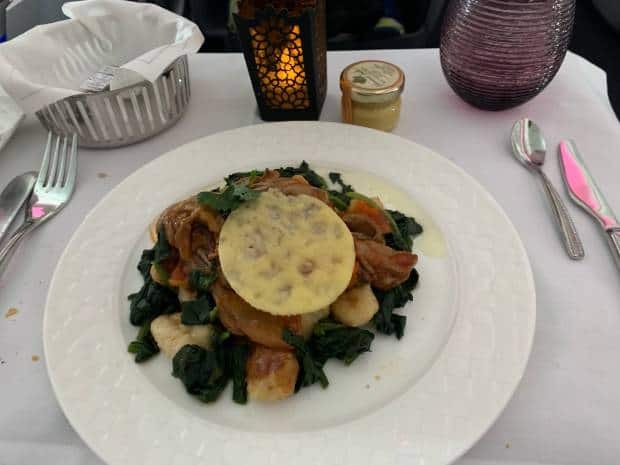 I’ve been largely impressed by the food offerings on the Business class flights I’ve been taking, but the food on the Qatar Airlines business class flight was a half step above the others. First of all they have an à la carte concept where they make what you want when you want it – so you get to eat when it makes sense to your own body clock. Just be warned – your best intentions are likely to go out the window when you see other people being served theirs and the delicious smells start wafting towards you! 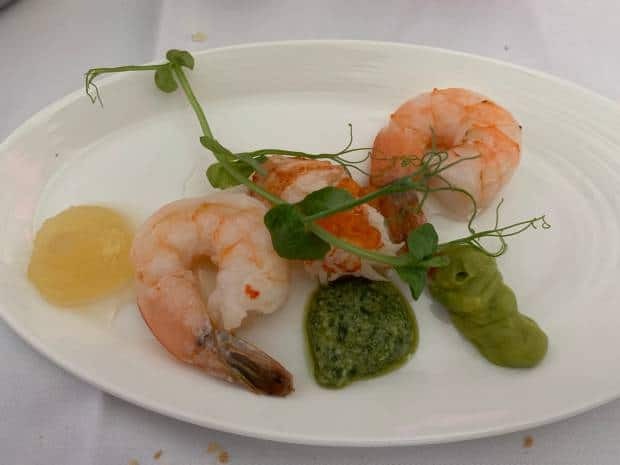 The prawn appetiser was yum, and they provided a little basket of three breads with a choice of dipping oils which meant that regardless of how small the mains and appetisers were, you wouldn’t be going hungry. I was particularly impressed by my main of lamb ravioli accompanied by my choice of ketchup or mustard. I’d like to take credit for the tastefully applied mustard but the star of the show was not my condiment application, but the lamb and ravioli. I think it was the textures that played off each other so well, or it might have been the sweetness of the carbs in the ravioli allowing the slightly saltiness of the lamb to really shine – I’m not sure, but it was really good. 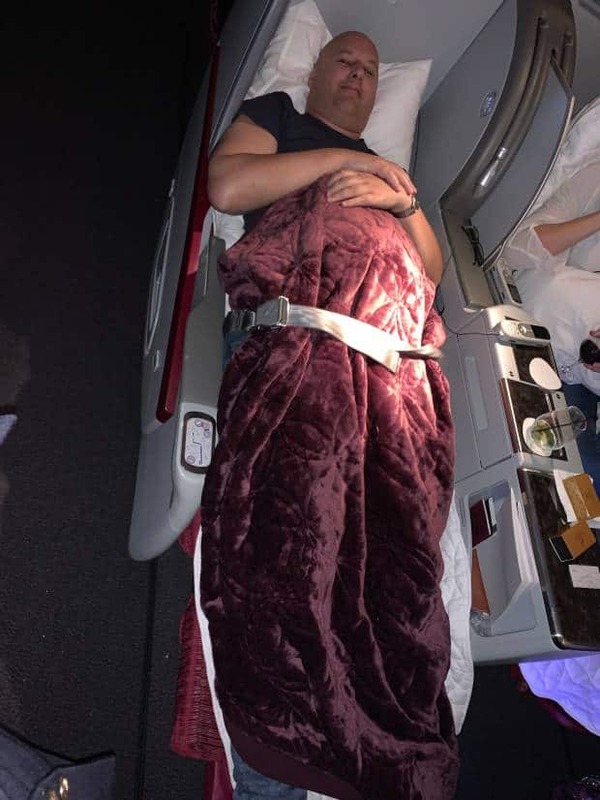 I did try to go to sleep a few times (that’s one of the ways I justify travelling business class to myself – I cant sleep in economy). Tania had prepped my bed with the thin mattress topper and I got the blanket out and made sure the seatbelt was visible, but sleep just wouldn’t come. 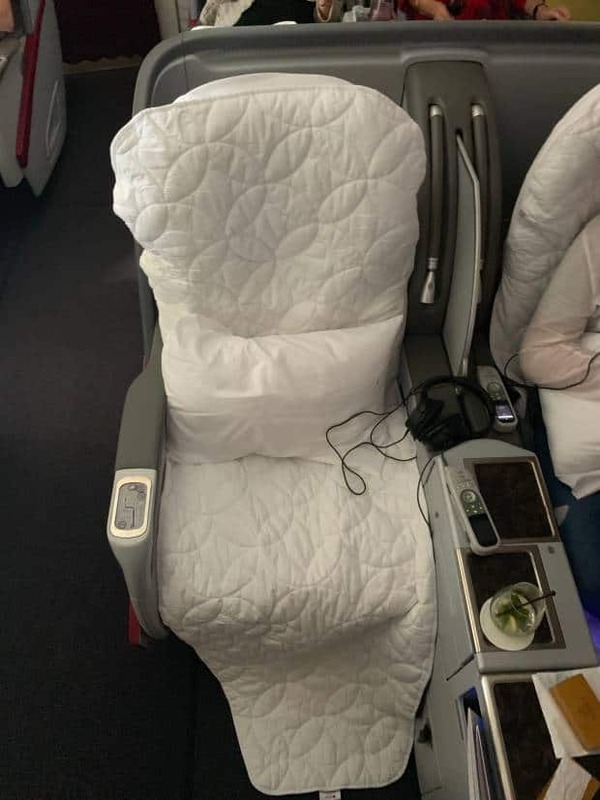 I cant blame the bed – though with my size the 22” width did feel a little constricted – as it wasn’t hugely different than any of the other business class flights I’ve taken. The seat itself lowered from the level used as a seat, but even so the leg section did angle down, making the lying angle less than 180 degrees. I found out later that the trick is to get the seat into bed node (single button for that), then alter the position of the seat back a little followed by raising the footrest – this made it closer to totally lie flat. With sleep not coming (and again, not blaming the seats for this one), I elected to watch movies and snack. 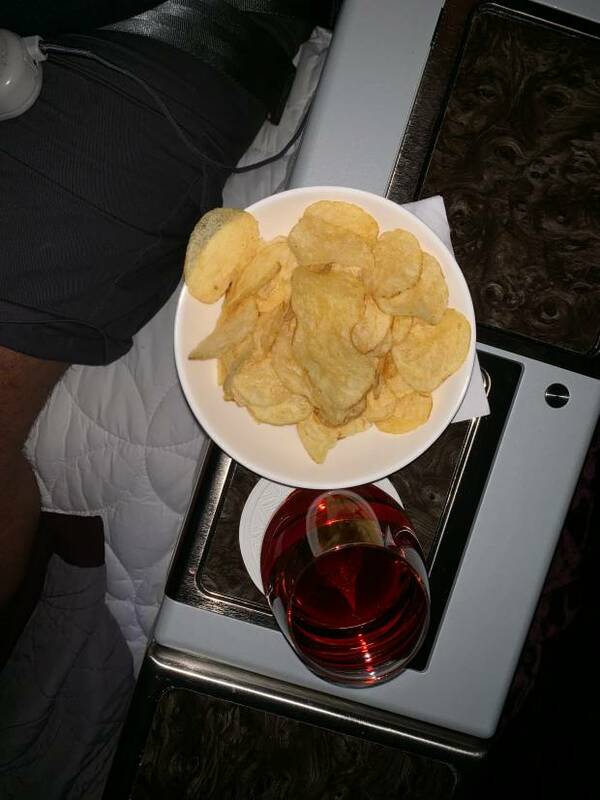 The attendants were most attentive, topping up my crisps and ginger ales plus offering me a wide range of cookies. Embarrassingly it seems the more space I get for my travels the less sleep I end up getting. Very hard to feel hard done by though, and I’m certainly not complaining! Eventually after fifteen or sixteen hours of flying I finally felt like I was ready to drift off, and then the lights started to come up indicating we should get ready for breakfast and then landing. Mutter mutter mutter. At breakfast I asked what the options were and Tania read them out. She was incredulous that I would consider the Arabian breakfast and after checking the menu I can see why. Feta cheese, cucumbers, tomato and green olives with foul medames and Arabic bread. Foul medames is a dish of seasoned fava beans. Certainly not the full English! I elected for the standard cooked breakfast which was an omelette with hashbrown, mushroom and a sausage. Pretty standard stuff. We landed not long after and I deplaned with everyone else and noticed that we were a long way from the terminal. Yup, no airbridge, which meant that, yes, a mobile staircase with buses waited below. We headed down and as I arrived at the bottom the first bus’ doors closed indicating that it was full. I was a little surprised as there weren’t that many people in front of me and all of them were business class passengers. 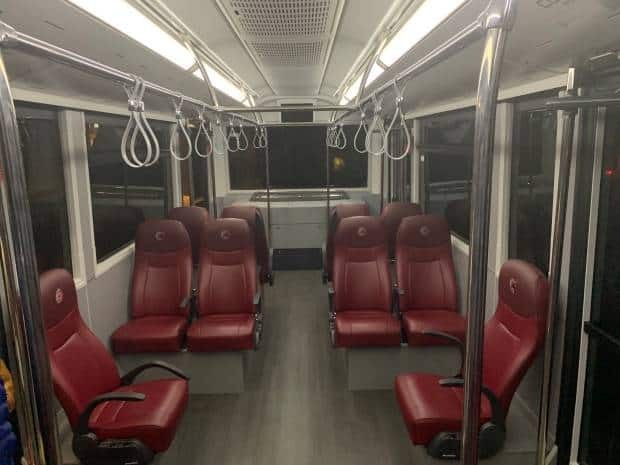 As I got on to the second bus I could see why so few could fit on: this was not your large people moving bus, this was a leather chaired ample room luxury shuttle. I was first on and grabbed a seat near the front, and even in my sleep deprived state (awake for 8 hours pre-flight, 18 hours on the flight), I kept an eye out for anyone old, infirm or with baby that needed my seat more than I did. I felt ok – the general out of body experience from lack of sleep aside. 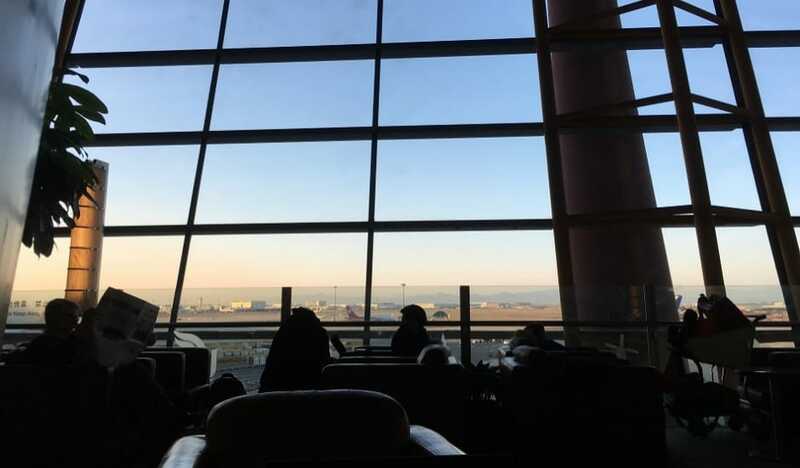 The short trip across to the terminal was frustratingly long – I could see out the front window past the driver and there were traffic lights, other vehicles and frequent usages of the universal hand gestures for “wtf are you doing?”. Eventually (10 – 20 minutes later) we were released at the doors to the terminal and joined a large mass of humanity ascending escalators to the arrivals area. Eighteen hours is a long time to be in a plane. I would have liked to have been able to sleep, but failing that my trip was about as good as it could have gone. 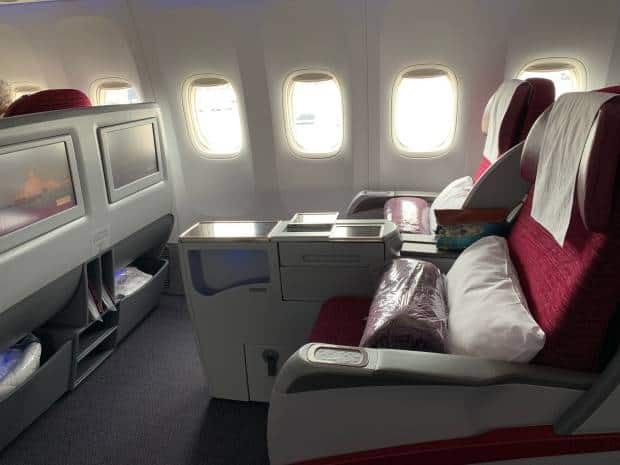 I also had a great benchmark for comparing the QSuites on my admittedly shorter hop from Doha to London. But first, the Qatar Airlines business class lounge!